Whelp, guess if I’m doing this I’d best introduce myself. I’m S.G. or Lego, depending on where you are on the internet. I’ve been drawing for quite a while, and was previously running a webcomic until changes in life forced me to put it on hiatus a year ago. I haven’t really drawn since then, aside from sketches here and there. Normally I find challenges like this way too, er, challenging, but creating characters is pretty much my favorite thing in the world to do, and I figure if anything can help me get my creative juices flowing again, this can. 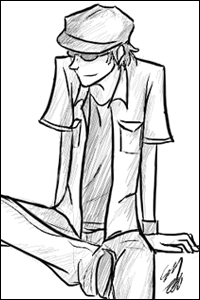 Anywho, I have (depressingly bare) deviantART and Tumblr pages, so feel free to poke around.